Montessori is different! And it works! According to the Wall Street Journal, a “Montessori Mafia” showed up in an extensive study about creative business executives. This Montessori Mafia includes Google’s founders Larry Page and Sergei Brin, Amazon’s Jeff Bezos, videogame pioneer Will Wright, and Wikipedia founder Jimmy Wales, not to mention Julia Child and rapper Sean “P.Diddy” Combs. Is there something going on here? Is there something about the Montessori approach that nurtures creativity and inventiveness? Montessori is different and it works! To visit The Montessori House, call or text 201-816-8343. Posted in Montessori Moments | Comments Off on Montessori is different! And it works! Artist at The Montessori House — Mitchell Schorr! Mitchell Schorr is a Montessori House parent He is also among the best known urban mural painters in the world and has painted 3-D murals in and around New York City parks for more than a decade. 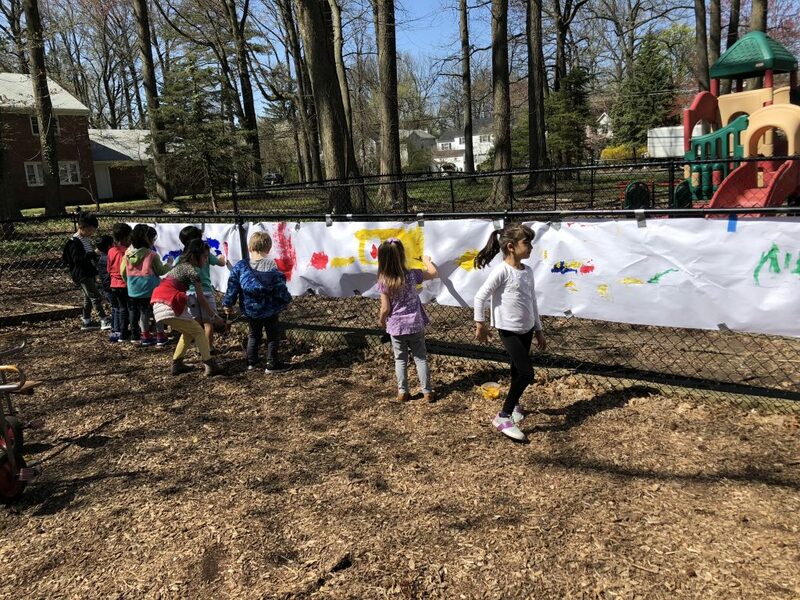 He chose a stunning spring day to work with students at The Montessori House to create a mural in our playground. The Blank Canvas with Mr. Schorr, Ms. Maria and student artists. Posted in Montessori Moments | Comments Off on Artist at The Montessori House — Mitchell Schorr! Thanks to Montessori House Families ! 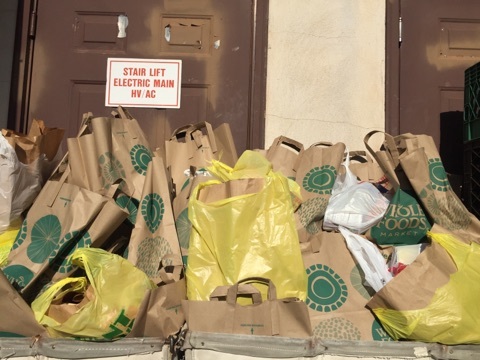 We collected a record amount of in-kind food donations for the Center for Food Action(CFA) in Englewood. (Parents can see more photos by logging in to the Parents section of our website and selecting Photo Gallery from the left nav bar). 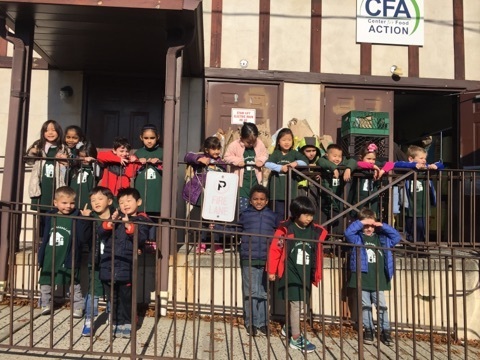 Today, with the help of many parents, we had a caravan of ten (10)parent cars make their way down Knickebocker Ave. to the CFA. The caravan carried our Kindergarten/First Grade students and our food donations, Once there, the children helped unload and also received a tour of the facility and some explanation of how their donations will help neighbors in need. Posted in Montessori Moments | Comments Off on Fall Food Drive Thanks! We had the pleasure of having Olivia’s grandparents — Alan and Bonnie — perform songs on mandolin and harp on March 17. Thanks for the lovely music! 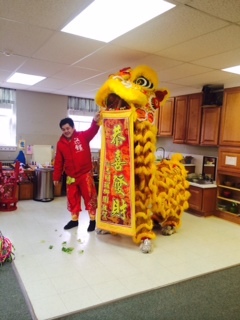 A big thanks to Huee (mother of Isabel and Mila), who arranged for our students to have a performance and demonstration on Wednesday of Lion Dance by The Wan Chi Ming Hung Gar Institute of New York City. 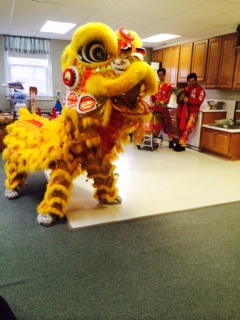 We were thrilled by the Lion Dance — as you can see below (WOW!). 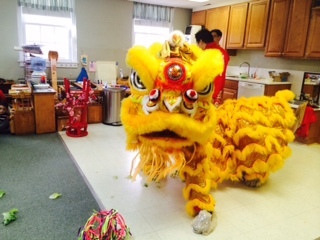 Posted in Montessori Moments, School News | Comments Off on Lion Dance! Interesting review in the WSJ today of a new book: Do Parents Matter? The LeVines are not arguing for abandoning Western parenting mores but making an eloquent case that wisdom requires a little humility about what is “right.” American children speak more and earlier than children in some other societies, but “we don’t know whether American preschool children actually have better conversational abilities than, say, French children or just lack the social skill to restrain their speech in adult contexts, as French children do.” All the talking we do with our babies may stretch their brains, but it also creates children who believe everything they say is worth listening to at all times. In any case, “once American parents free themselves from the expert warnings that any deviations from current American practices will constitute trauma, abuse, or adversity for their children’s development”—warnings that the LeVines show in this book are largely groundless—“then it will be possible to learn from other cultures and reduce parental burdens to a more sensible level.” Parenting is hard enough as it is. There’s no reason to lose sleep over things that aren’t worth worrying about. 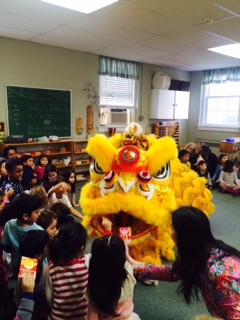 Yesterday, February 8th, our Montessori House parents joined children in all our classes for the best Lunar New Year celebrations. 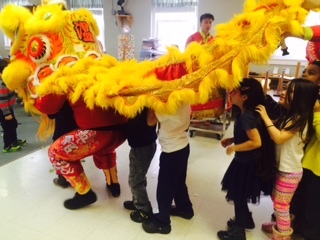 With stories, costumes, food, and more, our children had a chance to learn about and experience different aspects of this traditional holiday celebrated throughout East Asia. Thanks to all the parents who were able to join us! Here’s what we did on a snowy day! We often think of children at school only in the happiest sense, playing and exploring together, finding joy in their discoveries, and enjoying time with their friends. But a classroom, like the world outside it, is a mix of personalities, with varying maturity levels, backgrounds, expectations, and abilities. Sometimes those personalities clash, that happy setting is disrupted by conflict, and the children involved in the conflicts need to navigate their way back to a peaceful setting. Fortunately, teachers of young children are in a special position to teach children the peacemaking skills they need to resolve their conflicts and manage their anger, both now and in the future. 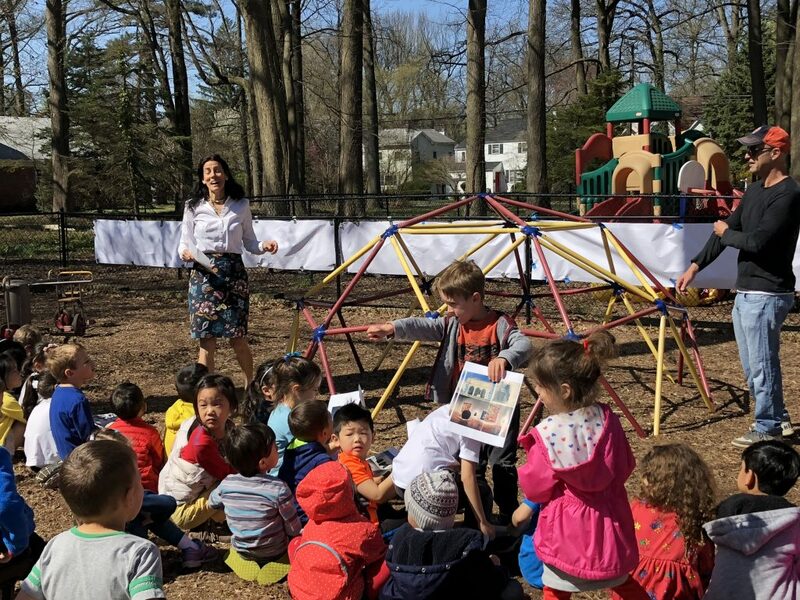 Action Research conducted by our Director, Maria Morningstar, explored the various types and sources of classroom and playground conflicts, and the effects of a peace curriculum in reducing and resolving those conflicts. 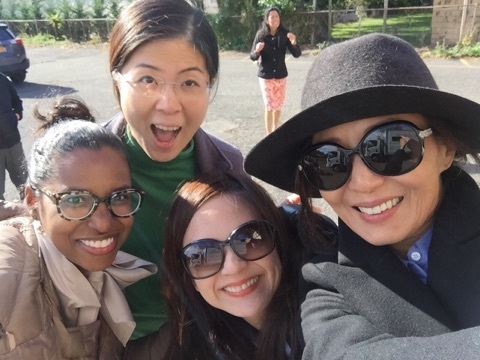 The purpose of her study was to determine whether teaching children about peace would help them to reduce or resolve conflicts in the classroom. The study took place in a suburban Montessori classroom of 26 children, ages three to six years. The data collected included observations of children’s conflicts and resolutions, conferences with the children and teachers, and children’s journal writings. The results: as the peace curriculum was implemented, there was a clear reduction in the number of daily conflicts among the children, and children involved in conflicts shifted from requiring a lot of teacher involvement to resolve their conflicts to needing little or no teacher involvement in the resolution. Ms. Phyllis baked a special Easter bread for her students: a Slovak Paska. A few families asked for the recipe, which may be found here.